REACH members aim to share Jesus’ love by providing helpful services that connect people in relationships. Judy joined the REACH Philadelphia Seventh-day Adventist church plant in 2011 after taking Bible studies from a classmate. At first, she was resistant to anything having to do with church, but over time, the Holy Spirit won her heart, and she became a committed member. When Remonde asked if she could come to church with Judy, she readily welcomed her and introduced her to new friends. Remonde began Bible studies a couple weeks later. 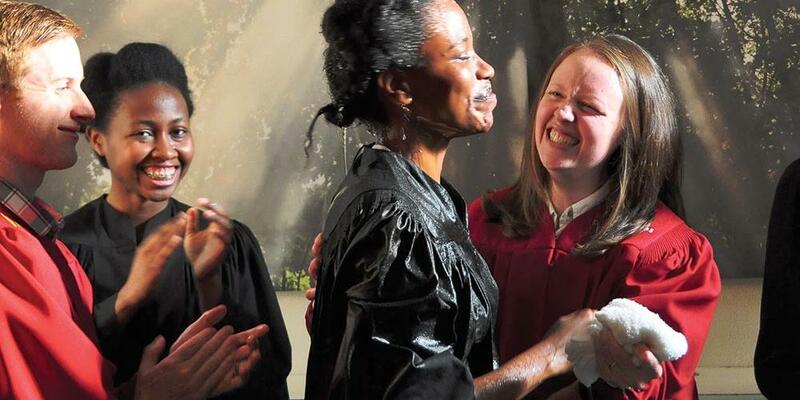 Recently, Judy stood beside her friend in the water as Remonde dedicated her life to Jesus completely in baptism. Remonde’s experience illustrates the importance of building relationships with people, attending to their needs, and practically demonstrating the love of Jesus. In September 2011, the mission-oriented church REACH Philadelphia was born in response to the Holy Spirit’s leading to further share God’s love in the city of Philadelphia. After much prayer, the REACH members committed themselves to creating a center of influence in West Oak Lane, a neighborhood in Philadelphia with no Adventist Church presence. An internship program was created for young adults to live in the community and employ their God-given talents to make a positive impact. REACH members aim to share Jesus’ love by providing helpful services that connect people in relationships. In 2011, REACH began assessing community needs by visiting neighbors door-to-door. As a result, REACH was clear that they must help West Oak Lane to empower young people in greater academic achievement and provide them with access to healthy, fun activities. REACH opened a tutoring center for students from pre-K through 8th grade, under the leadership of intern Pastor Tiffany Brown. At the conclusion of the school year, REACH Success had 17 volunteer tutors and 13 students, and the number continues to grow. One student, Taea,* had been written off by both her teachers and parents. “You shouldn’t waste your time with her,” her parents stated, as they came to enroll her sibling. Volunteer tutor Twana Ambrose Caries convinced them to enroll both children and worked with Taea one-on-one to improve not only her math skills but her confidence. By the end of the term, Taea experienced a dramatic change in her grades. REACH intern Jane Takahashi started an urban agriculture project to teach organic gardening and health. Through a community partnership, REACH was given a long-term lease on a plot of land where vegetables now grow, and neighbors contribute time through the Community Garden Club. Intern Angel Smith has developed a boot camp fitness class to combat obesity and promote community wellness. Intern Pastor Nick Snell organized block parties with the support of Jason DeLisser, and more than 100 people attended! Other REACH members share hope in Jesus through weekly Bible studies, literature evangelism, and Vacation Bible School. REACH originally met in a recreation center, transitioned to meeting in a store front, and has recently embarked on a new adventure to transform a former bar and nightclub into a more permanent center of influence in West Oak Lane. Please join us in praying for all God will do through this ministry center! REACH has internalized the parting words of Jesus, “Go and make disciples of all nations.” Go restore, go empower, go and call to action, go build loving communities, and go in the hope that all this can be accomplished in the name of Real Love. Tara VinCross is the senior pastor of REACH Philadelphia, in Philadelphia, Pennsylvania, and is in her seventh year of service in this city. In addition to continuing with REACH, she has accepted a call to serve the Columbia Union, launching a new young adult urban evangelism training center in Philadelphia, Pennsylvania. Jason DeLisser is a founding member and church board member of REACH Philadelphia and works for the United States Navy as an electrical engineer.